I could not get closer than 6-8 feet from the closed terrariums. Helpfully, each tarantula sat at the back of his glass cage, in obscurity. Looking at them, the dark threats I could see out of the corner of my eye, literally made me ill. I got literally, not metaphorically, dizzy, literally sweaty, and my skin literally crawled. My adrenalin spiked and it took at least 20 minutes, it seemed, to come down after we left the store. I had to brace myself for the tarantulas each time I visited the store, but in a strange way I might have been disappointed, though not much, if they were ever taken away. They were not. And since tarantulas do not float (to my knowledge), no hobbyist thought to add one to his aquarium, perched atop a plastic castle, perhaps waving a leg like a fist. In my years studying art history, I have seen many photos. Recreationally, I have enjoyed many wildlife photographs. But this picture has something special, something we are not supposed to see, it seems to me. 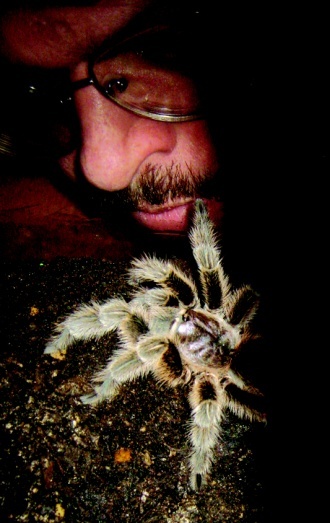 I see a member of the ancient species of tarantula moving one of her eight legs, touching the man’s lip with what seems like a certain purpose (exploration) and gentleness, even sensuality. She is not rushing at the man with all eight legs, action film-style. Gordon Grice is immobile, allowing himself to be touched on the face by the leg of a creature whose ancestors date to the Miocene period, meaning that she has identifiable relatives which are 16 million years old. I am watching two remotely different geologic eras take an interest in each other, even learn, perhaps play. Grice is clearly surviving, even enjoying the encounter. He is familiar with this species and this particular animal. Who thinks of the mentality of spiders? Arachnologists, I suppose, but no doubt much of their work revolves around the themes of predation and reflex. Who grants the spiders the dignity of thought? Spidery thought, but thought nonetheless? And who photographs that thought? Who photographs spidery pioneering? Parker Grice, Gordon’s 14 year-old son, was on hand to capture the transcendent moment in which his scientist father interacted with the boy’s pet, spookily named Zodiac. (With uncanny adolescent wit, the boy evokes the serial killer and doubles the spider’s spookiness. I cannot help but recall the killer who bellowed out that immortal phrase: “This is the Zodiac speaking”.) Parker saw the spider reach for more information, with a jointed leg ending in a cat-like claw, and shot an encounter in close range that conveys the beauty and wonder of two such improbable species communicating, not merely brushing past each other with little screams. Within the time frame of this photograph, there is an actual interaction between these two species. If you showed me a picture of a cat touching a man, I would be unsurprised to see affection and curiosity. If you showed me a picture of a shark biting a man, I would be unsurprised to see what looked in its destructiveness like rage. But here is an astonishing mood, in which I, with criminal anthropomorphic attributions, see a certain languid engagement on the part of this primitive spider. Her touch—-this moves and sickens me—-seems affectionate. She knows Grice is safe and can afford to get to know him a little more. Scientists would rubbish these thoughts, but as an art history major, I am allowed to keep them. It is the singularity of the leg that makes it all seem so tender, so obviously cognitive. Is this the tarantula version of Michelangelo’s “Creation of Adam”? This spider is thinking about this man. On film. This photo is lightning in a bottle. (1) Gordon Grice, Deadly Kingdom: The Book of Dangerous Animals (New York: Dial, 2010), 165. This entry was posted on Wednesday, August 25th, 2010 at 1:47 pm and is filed under Photography. You can follow any responses to this entry through the RSS 2.0 feed. You can leave a response, or trackback from your own site. Cool. Don’t show this picture to my daughter. She doesn’t have your presence of mind. You’ve nothing to worry about the climate in the UK means these spiders only survive on the south coast, everywhere else is safe. This is sweet …honestly I’m not posting it to spook any arachnophobes … it’s actually an account of an arachnophobe learning to appreciate spiders, oh and it wasn’t feral, despite the link title. Kelf you can sleep in peace!